With a first degree in botany, Tim entered the turf industry in 1989 as a research worker investigating the ‘Construction, Irrigation and Fertiliser Nutrition of Golf Greens’, work funded by the R&A. His PhD from the University of Leeds was awarded in 1994 with a thesis of this title. After undertaking further research work in golf, Tim became an agronomist working with sports facilities throughout the north and east of England. In 1997 he moved to Suffolk and formed Agrostis in 2005. Agrostis was incorporated in 2008 and provides consultancy services for all forms of outdoor sports facility, both natural turf and artificial surfaces. Tim provides advice on sports facilities throughout England, particularly in the south and east. 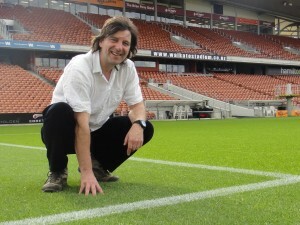 Much of his work is with the procedural aspects of sports pitch creation and improvement through funding bodies such as the FA and Sport England. He has designed and managed sports facility projects with values over £1.2M. All aspects of the project are covered, from feasibility study, design, through planning, procurement and contract management to completion. Projects involving combined natural and artificial turf facilities are a particular interest. Further details about the company in general and some of the projects undertaken may be seen on the Agrostis website.